For 30 years, José Mateo’s holiday classic has been the little “Nutcracker” that could. Standing in the shadow of Boston Ballet’s grandly opulent version, the José Mateo Ballet Theatre production has become valued for its smaller, more intimate scale, its streamlined narrative, and its affordability. That means a relatively modest budget, so canned music and a low-key but convincing scenic design (by Laura McPherson). Though lacking in virtuosic fireworks, the dancing is solid, performed by a diverse cast of more than 200 children and adult professionals. With extended runs at two theaters — the Cutler Majestic and the Strand — kudos for accessibility as well. Mateo keeps the narrative bones of the classic tale but reimagines some characters and sequencing, moving it all along at a brisk pace. He plunges us into Clara’s dream world from the opening curtain, as she discovers a mysterious gift while fairies dance around a maypole-like “tree.” Putting Clara front and center from the beginning creates an engaging hook for young viewers. For Sunday evening’s performance, 13-year-old Shaye Child was a poised, accomplished Clara, sailing through Mateo’s challenging choreography on pointe with lively personality and solid technique, her tight footwork and crisp turns softening into balances of airy suspension. Jim Banta was a charismatic Dr. Drosselmeyer, imbuing the role with a touch of playfulness. He projected just the right blend of pride and exasperation with two renegade mechanical dolls. Haruka Tamura was charming as Columbine, hyper-articulating each gesture, from flexing a foot to blowing kisses. Banta enlivened what can sometimes be a rather dull party, as did the impish boys who ran about creating havoc, breaking Drosselmeyer’s present to Clara, the Nutcracker doll. The traditional battle scene predictably featured high-stepping soldiers and a cadre of comically adorable little mice scurrying about. The fighting was lively without being menacing, with rubbery swords jiggling rather than clashing. Though Patrick Green’s Mouse King was fearsome, he lightened the mood with a wave to the audience as he succumbed and was carried off, trailed by a bevy of teary-eyed mice. Sweet. Choreography for the forest scene is initially a little flat, with routine phrases missing some of Tchaikovsky’s breathtaking musical high points. As the Snow Queen, the ever-capable Madeleine Bonn seemed uncharacteristically stiff, her leaps and extensions a little saggy, though timing in the arms and upper body was impeccable. 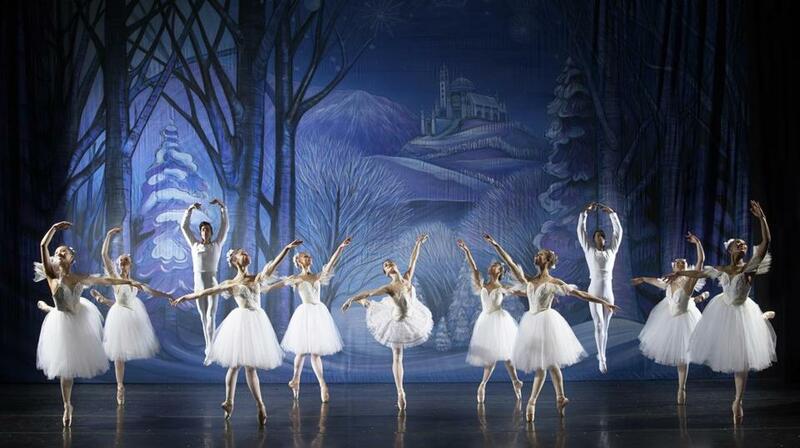 She was partnered by four Snow Princes, who also brought elevation to the dance of the Snowflakes. As they spiraled into eye-catching patterns, lifts sent fluid limbs and swirling skirts floating through the air. The final tableau, Bonn spinning aloft as snow fell from the rafters, was gorgeous. Mateo opens Act II with a lovely variant. Clouds of mist and a starlit backdrop set the scene for a host of cherubs and angels. Angie DeWolf’s Sugar Plum Fairy and Spencer Doru Keith’s Cavalier provided a warm and gracious welcome to the Kingdom of the Sweets, offering some of the evening’s best dancing. Keith unleashed some flashy tours en l’air and buoyant jetés. The character dances were solidly performed if unremarkable choreographically — a spirited “Chocolate,” a saucy “Tea,” an energetic “Trepak.” Cute Polichinelles spilled out from under a rather clenched Mother Ginger, and Magdalena Gyftopoulos and Junichi Fukuda unfurled a sensuous, beautifully calibrated “Coffee,” with luxurious extensions and supple arched backs. However, the “Waltz of the Flowers” feels like a real misstep. The music begs for a large ensemble of nonstop colorful swirl, but Mateo chops it into small, linear configurations with too little flow.